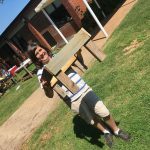 Our summer program which we call the Kitchen Garden Corps was formed 5 years ago in 2014 at Clarke Middle School where Wick Prichard served as our first AmeriCorps VISTA school specific gardener. The KGC was our idea of how to make use of a school garden during the summer. With the help of Debbie Mitchell and Tad MacMillan, we ran five weeks of the Kitchen Garden Corps with an average of about 3 kids a week. In total 8 different middle school kids gave us the benefit of the doubt that summer that we could take care of a garden, chickens, goats, and run a farm to table, made from scratch restaurant. 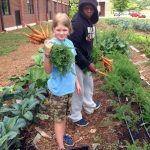 At present, the Kitchen Garden Corps averages about 25 kids a week with around 70 different individuals from all four CCSD middle schools. 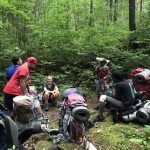 And we now complete a yearly backpacking trip on a section of the Appalachian Trail, cementing our efforts to connect sustainable agriculture, community planning, and environmental conservation. 1) providing a diverse group of youth with opportunities to transform their lives through education, employable skills, civic engagement, and leadership. 2) providing opportunities to a diverse group of youth to grow their own food and to create access to fresh food for their community. 4) conserving and restoring natural resources by practicing organic agricultural methods. 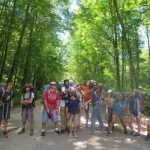 5) creating environmental leaders of the future by teaching environmental ethics and behaviors to children, teens, and adults. If we had a definition of the Kitchen Garden Corps, it would read: We are a Do-It-Ourselves community with a focus on cooking, gardening, food preservation, nutrition, small farm animals, sustainability, the environment, and our local, state, national, and world communities. Student arriving at 8 AM, playing a teambuilding game, doing some work in the garden, making their own homemade snack, learning about the cuisine of Columbia, preparing part of our Thursday meal, canning dill pickles, cleaning up, and heading home at noon. 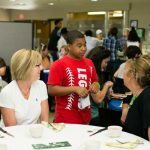 The camp meets Monday to Thursday from 8 to 12 at Clarke Middle School and the Athens Community Career Academy. 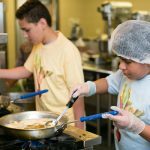 We have a camper run restaurant on Thursdays which usually means camp runs that day until 1:30 – 2 pm. The restaurant is located in the HT Edwards Building (Athens Community Career Academy) some minutes-walk from Clarke Middle. We start camp the week of June 11 and continue for three weeks through the week of June 25th. We do not run camp the week of July 2nd due to the July 4th holiday. We resume camp the week of July 9th for three weeks concluding with the week of July 23rd. During the week of July 16th-July 19th, we will not hold the Kitchen Garden Corps at Clarke Middle School, and we will not run our restaurant. We will instead go on a backpacking trip, leaving that Monday and returning that Thursday. 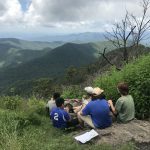 Our location last year was on a segment of the Appalachian Trail in north Georgia.